Opulent Bandar Seri Begawan | What an Amazing World! Brunei Darussalam (Brunei, Abode of Peace) is one of the smallest countries in Southeast Asia (in fact by population it is the smallest country in the region with population of only 400,000 people). The nation’s capital and largest city, Bandar Seri Begawan, is the place where Nurul Iman palace (the world’s largest residential palace) is located. Bandar Seri Begawan might not have super tall skyscrapers, but it has some of the most opulent mosques ever. 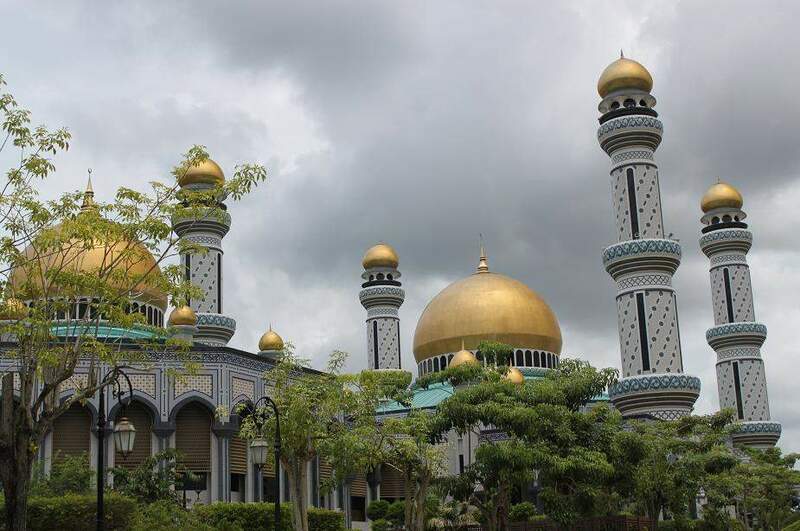 Sultan Omar Ali Saifuddin mosque, which is located in the city center and facing the Brunei river, dominates the skyline and undoubtedly becomes the landmark for the capital, and even the whole country. Its gleaming golden domes shine brightly even on cloudy days. Adjacent to the mosque, an artificial lagoon (with a boat-look-alike platform used for royal ceremonies right in the middle of it) reflects the mosque and its splendor. 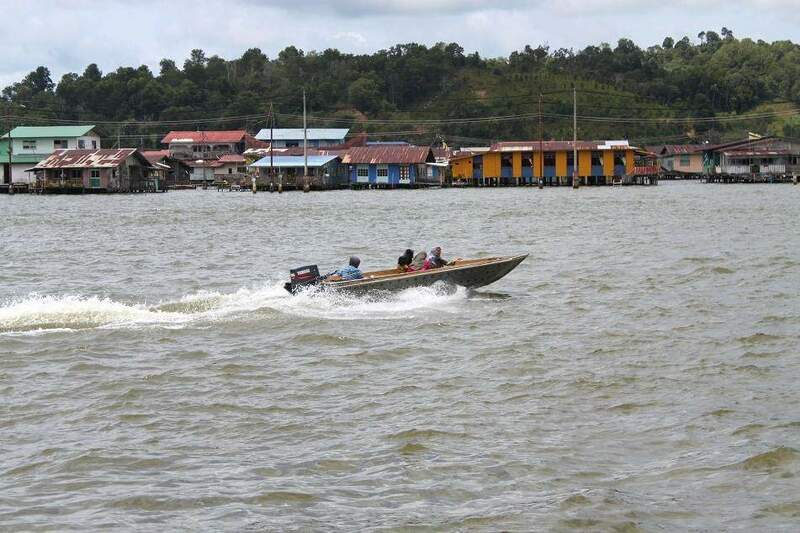 From the mosque, take a stroll on the banks of Brunei river and you will see Kampong Ayer (traditional houses built on the water) on the other side of the river. But Sultan Omar Ali Saifuddin mosque is not the largest mosque in the country. Go to the central bus station and take bus no.1 (circle line) to get to Kiarong area where Jame’asr Hassanil Bolkiah mosque (also often called “The Big Mosque” by locals) is located. Go inside the main praying hall to witness the work of art in the interior which truly is a masterpiece. The ceiling (inner part of the main dome) is decorated in European style and painted in bright white and finished with gold lines, while the walls in the front are ornately adorned with gold plates which are engraved with beautiful patterns and calligraphy. If I have to describe Brunei (especially Bandar Seri Begawan) in 5 words, they would be: Rich (women carrying shopping bags from Harrods is not a rare sight), Clean (Bandar Seri Begawan’s cleanliness is comparable to Singapore), Quiet (unlike other bustling and rumbling Southeast Asian capitals, with only 140,000 residents you can imagine how quiet Bandar Seri Begawan is), Well-Educated (most Bruneians speak English very well, even those whose jobs have nothing to do with foreigners. They also drive in a very good and civilized manner), and Religious (most women wear head scarves yet colorful dresses). Bandar Seri Begawan is not a tourism hotspot in Southeast Asia. But for those who want to take a short break from traffic, touts, scams, noise, etc, it might be the place to go. Envy me not! 🙂 Well, you went to more places in Thailand, while I only visited Bangkok. love your first pic. the night view is so fantastic! Thanks Fiona! Actually it was taken very early in the morning (around 5 am). Opulent is quite a good description for this place, well, that mosque is impressive. Great post! I honestly have never heard of this place. Are you traveling now or writing about previous travels? Where do you live? I would love to really see Asia but I feel like it would require months on end. I’ve only been to Nepal, a few days in India and Japan. I hope to someday see these parts of the world as they are definitely on my wish list! Thanks! I traveled to Brunei just last week, and currently I’m living my ordinary life as a working man in Jakarta, Indonesia (I wish I could escape my cubicle one day and live as a real traveler). Usually most people start their Asian journey from Southeast Asia as it is an easy place to go to and it’s incredibly cheap! But it’s such a great thing that you have visited Nepal, India and Japan. Three of the countries that I want to visit the most. Cool… just in one month, 4 countries! >,<" and solo too! Unless I become so impulsive and randomly buy a return ticket to somewhere new. Unfortunately I didn’t take a picture of that woman because I was busy focusing on finding a bus shelter near the airport (which I couldn’t find!). Wow your description makes it sound like the perfect place. Kind of like a utopia! Your photos are beautiful, especially the one with the reflection on the water. Thanks Elle! 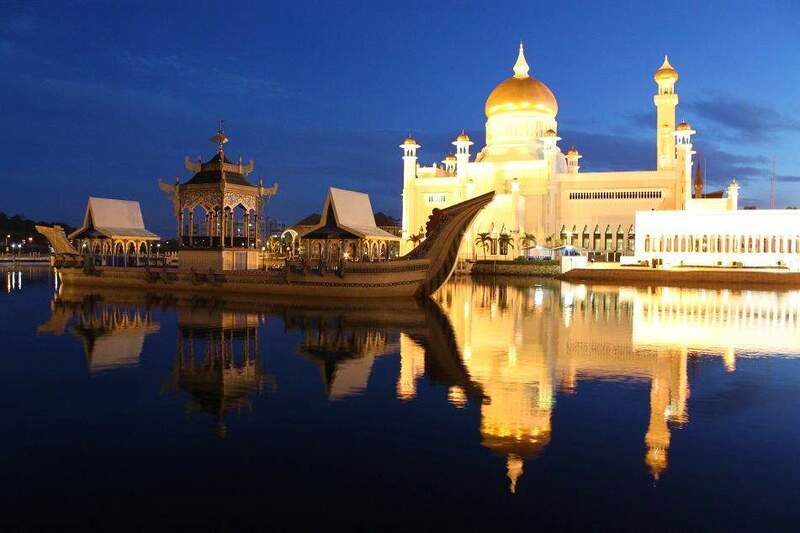 Compared to other Southeast Asian countries, Brunei is indeed kind of a little bit utopia. Oh and the streets remind me of Germany with so many cars parked yet so few people around. Those are some gorgeous pictures! Hi Jodi! Glad to hear from you again, and thanks! 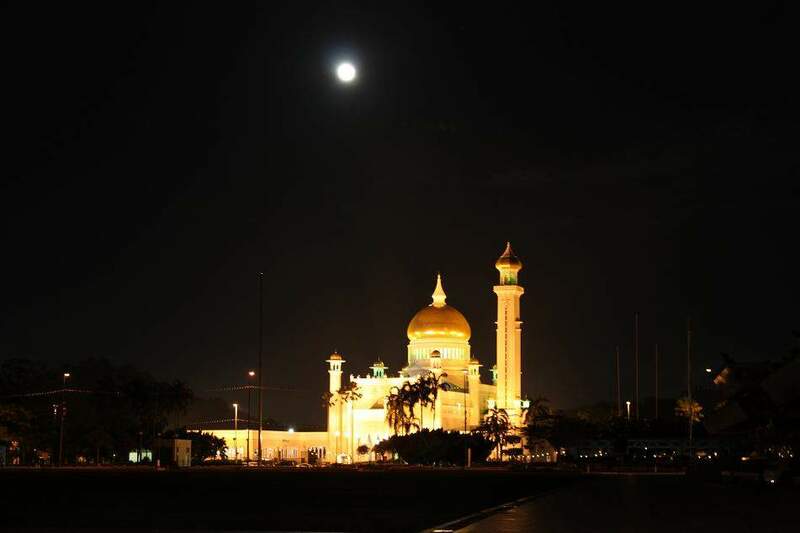 Kak Bamaa 🙂 I like your Sultan Omar Ali Saifuddin Mosque under A Full Moon picture, your pic is GREAT as always. 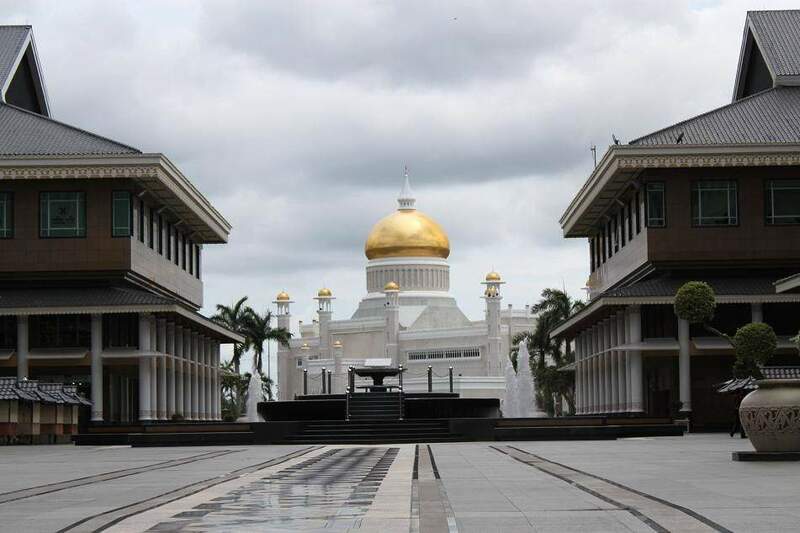 I’ve been to Brunei and absolutely loved it. It deserves a lot more popularity in my opinion. 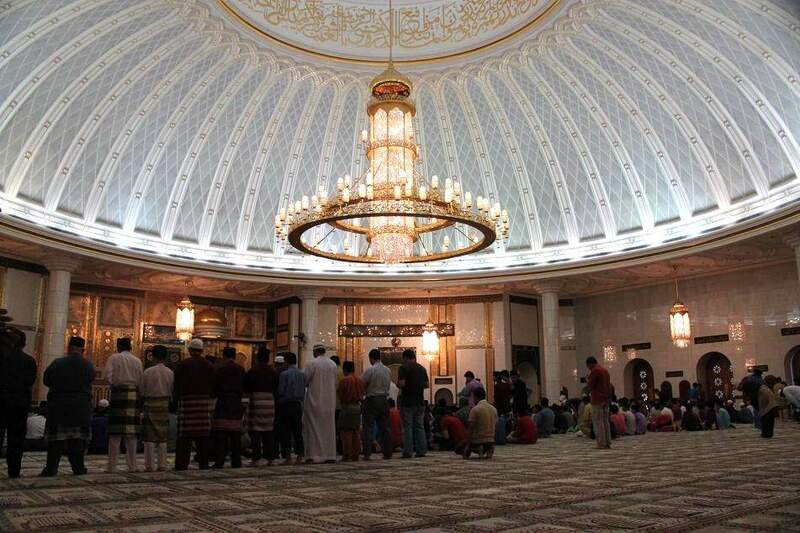 Thanks for sharing, nice mosque interior pic there! If I go back to Brunei one day, I might want to check Kampung Ayer out, and maybe also the rain forest. Thanks for dropping by Ruzhi! Hi Fauzi. Bandar Seri Begawan cukup mudah untuk dieksplorasi kok karena kotanya yang sangat kecil.